It’s stressful when you worry about elderly parents living alone, but they’re insistent on not entering a retirement facility. It’s tough to relax when they’re determined to stay independent, but there are definitely steps you can take to help put your mind at ease. Many seniors could spend more years safe at home if you follow the five simple safety measures below. Make climbing stairs safe and easy by installing a stair lift. Stair lifts are a must for seniors with difficulty walking, seniors recovering from surgery or just as a convenience when going up or down stairs carrying objects like laundry baskets. Even if it isn’t used every day, a stair lift is there for the times when arthritis flares up or tiredness makes navigating stairs dangerous. A walk-in bathtub makes bathing more comfortable and safer for seniors. Don’t rely on grab bars by the tub to prevent slipping and falling. Walk-in tubs eliminate the possibility of slipping and provide therapeutic benefits for seniors suffering from arthritis and other aches and pains. Walk-in tubs are leak-proof and come with extras like a whirlpool bath option and multiple jets to soothe lower back and leg pain. Security systems like those provided by Vivint Home Security can help protect seniors. A security professional in Ann Arbor MI has said that seniors have options that allow them to be safeguarded from intruders, be warned about severe weather, and wear medical pendants that require only the push of a button to summon medical personnel in the event of a fall or symptoms of a stroke or heart attack. Family members could even use sensors to remotely monitor your parent’s eating habits and medication usage. 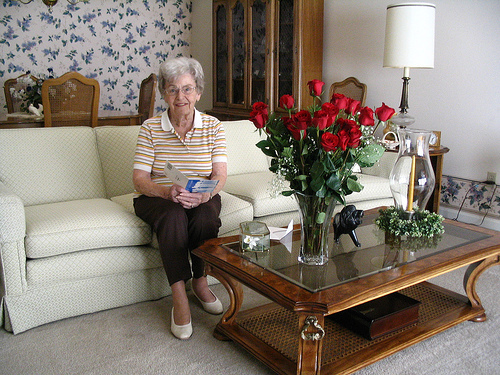 Security systems are highly helpful, especially for seniors living alone. Arthritic joints get stiff after a senior sits for a while. Lift chairs come in a variety of attractive styles and may even be free or discounted through Medicare. A lift chair makes standing safer, especially if the senior needs to reach a walker upon standing. Adjustable beds, like lift chairs, make getting up easier when seniors have arthritis. Adjustable beds are also ideal for post-surgery recovery and people with breathing problems like COPD. Sleeping in an upright position can make breathing easier and lessen hip pain. Beds are available with double mattresses so couples can individually adjust their side of the bed. The suggestions above will help you worry less about your elderly family members, and make them more comfortable. Don’t forget that a simple phone call every day also helps you monitor elderly relatives and can be a lift to their spirits!